"Having the complete streetplan and being able to pick out individual details allows us to start zoning the settlement and examine how it worked and changed through time," Martin Millett, Laurence Professor of Classical Archaeology at the University of Cambridge and Fellow of Fitzwilliam College, said. "It shows that this was a lively and busy place, even though most scholars have reckoned that it was marginal and stagnating. We have also carried out research in the surrounding countryside which adds to the picture because it shows that the nearby farmland was thriving as well." Interamna Lirenas is an enticing case study because, in spite of its size, it did not expand significantly during the high point of Rome's Imperial age, meaning that it retained much of its original colonial shape and features. The main techniques they used were magnetometry and Ground Penetrating Radar (GPR). Magnetometry measures changes in the earth's magnetic field caused by different features beneath the surface, and allowed the researchers to identify the town's overall layout, many individual buildings and a wide open area in the settlement's centre – its forum or marketplace. 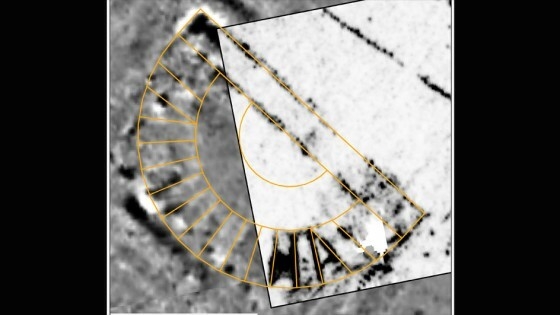 This technique was applied after the initial survey revealed the existence of a large building at the northern corner of the forum that the researchers could not make out. GPR analysis revealed that the building had several walls arranged in a radial pattern, creating a semicircular seating area. This conclusively proved that they were looking at the remains of a Roman theatre. Judging by its structure, it is believed to date from sometime around the turn of the First Millennium. These features matter, Millett argues, because the traditional view was that each colonial settlement had a standard template so that Rome could project a certain image of itself for the benefit of a subject population. Yet the new pictures from Interamna Lirenas show how different towns were designed according to equally different ideas about how a colonial town should look, and what the community's priorities should be. Further studies should also help to confirm how many people lived in the settlement at different times. "Part of our analysis involves trying to say which areas were used for housing and what types of houses they were," Millett said. "Until we have been able to do this it will be difficult to put a firm figure on the population. However, we are talking about a community of a few thousand people."